I love books that influence the state of my mind and the state of my being. When I’m reading such a book, I can slowly feel it pitching a temporary tent inside my brain – stretching the canvas, hammering the stakes with a mallet, inflating the air mattresses, checking the flashlights, lighting the firewood and so on. Together we make happy campers, spiritually and emotionally invested, till the last word on the last page has been consumed, and then we pack up and go our separate ways. It so happens that I’m ‘camping’ with M.F.K Fisher’s, “The Art of Eating’ these days and quite predictably, all I am mulling over is food and how meditative cooking, feeding and consuming can be, especially if it is one of your favourite pursuits. From the precise moment when the potent stomach growls of your guests give way to their appreciative ‘ahhs’ as your luscious creations land the table to the prolonged hush with shoulders hunched over plates, ending with loud placid sighs, you know everything’s gone right. It is a process that’s unnerving for the cook to watch, yet immensely fulfilling at the same time. However, what you always end up with, after such unnerving yet fulfilling sessions, is at least one curious soul enquiring about the recipe, which I have trouble giving out, not because it’s some closely guarded secret handed down through generations (though this sounds much more dramatic) but because I don’t follow recipes to the T. This explains why I am a sloppy baker. Anyway the thing is, when I try something new, I have the taste of that dish registered in my mind and I gear my ingredients towards that taste while cooking. Yes I look at the recipe for structure and method, but I am not a slave to it. I use imagination, I tinker around and make it my own. When I say this to the recipe-enquirer who was expecting a list of carefully measured cups, teaspoons and tablespoons, I can see disappointment creeping across her face like dark approaching clouds. 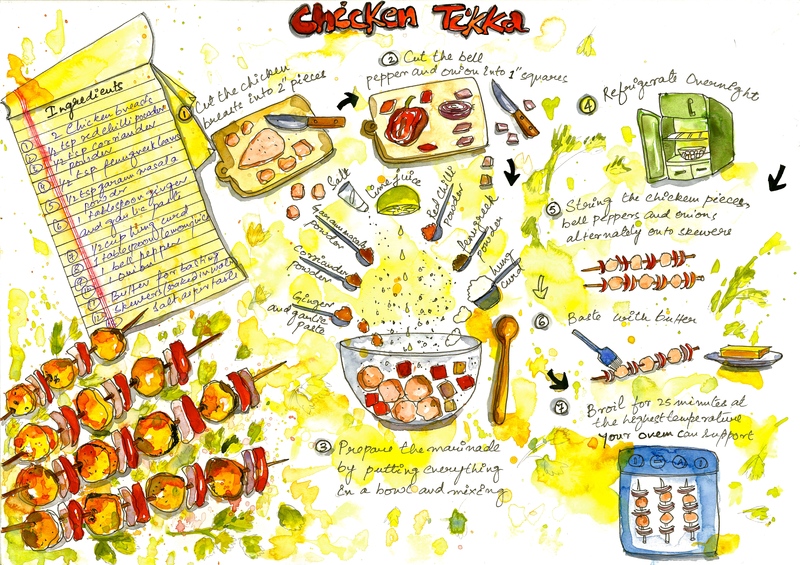 To avoid reciting an insipid list of measurements and yet pacify my guest by conveying the message in a tangible and useful manner, I tried illustrating one of my favourite Indian recipes – Chicken Tikka. Well, I had fun! Playing with food has its merits. Hope it goes down well with others. This entry was posted in Daily Vignettes and tagged Art of Eating, Chicken Tikka illustration, Food, Food illustration, Indian food, M.F.K Fisher, recipe, sketching, watercolours on November 11, 2014 by Somali Roy.